America House Kyiv is the United States’ premier venue for cultural programs and outreach events in the nation’s capital. A comfortable, tech-forward place for open dialogue, idea generation and innovation, America House hosts a wide variety of activities, including discussions on pressing policy issues, speaker series, workshops, movie nights, discussion clubs, art exhibits, and concerts. America House is a welcoming space for the Ukrainian public. All visitors will be treated with respect in a courteous and friendly manner. All visitors are welcome at America House during operating hours unless otherwise posted. Groups are invited to visit during general public hours. Tours of America House are given on request if not disruptive to events in progress. Visitors are welcome to attend public events as long as space is available. Please note that registration is required for some events. To enter America House, all persons, age 16 and older, must present state-issued photo ID (internal passport, foreign passport,driver's license or temporary residence permit) to the guards. Visitors 14-15 years old may present official school ID to enter America House. Children aged 13 and under must be accompanied by a parent or a guardian. All visitors and their effects are subject to screening by security personnel. Cell phones and other personal electronic equipment are allowed. America House public access technology is free of charge. Picture taking and sharing is encouraged. America House is wheelchair accessible. Explosive devices, flammable liquids, guns, edged weapons, pepper spray, and other hazardous materials are prohibited. America House guards cannot provide storage of such materials. Visitors are not allowed to bring alcohol into the facility. No pets are allowed in the building (except for service animals). America House is a place for open dialogue. Guests must be respectful of other guests and their views. Visitors who are inebriated, under the influence of drugs, or acting inebriated or under the influence of drugs. Disruptive behavior, such as creating loud noises, loud talking, screaming, or abusing America House equipment/property. Entering America House barefoot or without a shirt or removing one's footwear or shirt while in America House, or being otherwise attired so as to be disruptive to the America House environment. Having offensive body odor or personal hygiene so as to unreasonably interfere with other visitors' ability to use America House and its facilities. Smoking is prohibited inside America House. Using America House technology or Internet access to engage in any activities related to gambling, accessing sexually explicit material, violating copyright laws or illegally copying intellectual property, abusive or objectionable language, or unlawful or malicious activities is prohibited. America House reserves the right to deny usage to persons engaging in these activities or any others that do not conform to common understandings of appropriate, considerate behavior. America House staff or security guards will ask visitors who violate any of these rules to leave. 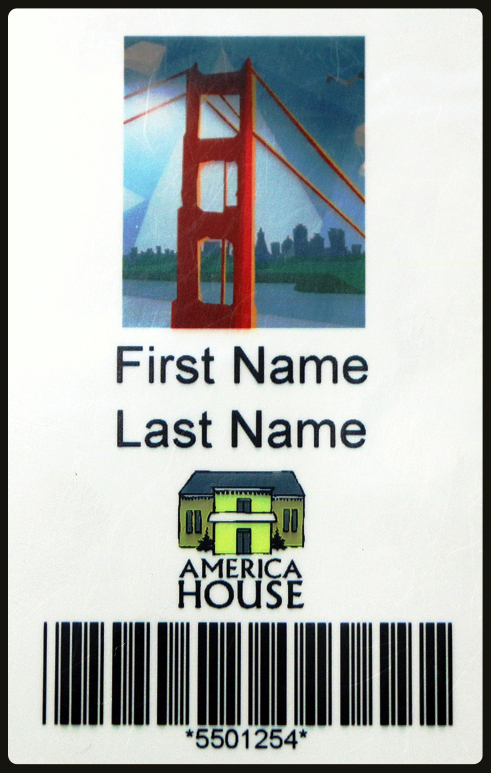 America House invites visitors, age 16 and older, to become a registered member and visit often. Come to the America House reception desk (12:00-8:00pm Tuesdays-Fridays and 10:00-5:00pm Saturdays) and ask a staff member to sign you up. Please note, during busy times, staff may be unable to assist and will ask you return at another time.. Present your ID and fill in a simple form. Smile for your picture and take your America House membership card home with you. Membership is free of charge. It is valid for two years and can be renewed. America House is a program of the U.S. government administered by IREX. America House is a place for open dialogue. Guests must be respectful of other guests and their views. Please note that the views and information presented by guests of America House are their own and do not necessarily reflect the official policy of the U.S. government.